Another 27 million trees died in California last year due to the lingering effects of drought, according to new aerial survey data from the U.S. Forest Service. That brings the total number of trees killed statewide to a staggering 129 million since 2010. In a typical year, about one million trees die across California. But beginning in 2014, that number began ticking up as aerial surveyors with the U.S. Forest Service started to notice entire hillsides turning yellow, brown and orange. At the height of the drought, in 2016, they counted 62 million dead trees in a single year (here is a map of the mortality progression). Adrian Das, a forest ecologist with the U.S. Geological Survey, previously told KPCC that he wasn't surprised that after a single wet winter, trees were still dying. “The trees have been weakened and under a lot of stress and we have these beetle populations that are doing well,” he said. Drought often kills trees indirectly. By depriving them of water, trees become weakened and unable to ward off diseases, fungus or bark beetles, which are always present in the forest but explode in numbers when trees are unable to fight them off. Last winter, more rain and snow fell on parts of the Sierra Nevada than in the previous four years combined. Some trees have recovered, and the death rate is slowing down. The lower rate could also be a result that so many trees have already died, so there’s just not much left to be killed, said Stephanie Gomes with the U.S. Forest Service’s tree mortality task force. Indeed, this year’s data shows species with lower death rates in the past are dying in different parts of the state. 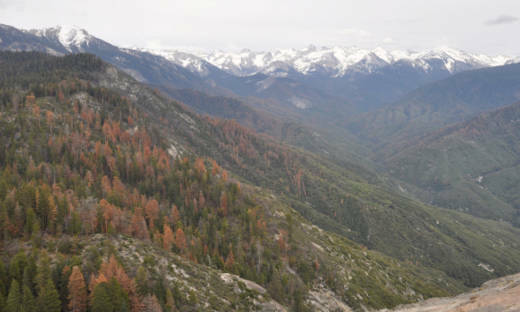 Previously, the hardest-hit species and regions of California were pines at lower elevations in the Southern Sierra Nevada, where the highest temperatures sucked water out of soil, depriving trees of what little moisture existed. Now, Gomes said death rates are increasingly in higher elevations among fir trees in northern reaches of the mountains. Part of the problem, scientists say, is that forests throughout the West have too many trees. Historically, many forests used to experience fire more frequently than they do now, which resulted in saplings and small trees dying in the blazes and leaving many forests more open. In the past century, firefighters put out those fires, meaning more small trees were able to survive and forests became crowded. Now, climate change is forcing more trees to compete for a dwindling amount of water. As temperatures rise due to increasing greenhouse gas emissions,more water gets sucked back into the sky and out of the soil and the ground. Gomes said the U.S. Forest Service is trying to compensate by thinning out forests either through logging or with prescribed fires so trees don’t have as much competition for water. The agency will also be prioritizing removing dead trees that may pose a safety risk, such as those growing along highways, campgrounds, and power lines. But it is difficult for the agency to do this work when more than half its budget every year goes to fighting wildfires. "As fire suppression costs continue to grow as a percentage of the Forest Service’s budget, funding is shrinking for non-fire programs that protect watersheds and restore forests, making them more resilient to wildfire and drought," Randy Moore, Regional Forester of the U.S. Forest Service, Pacific Southwest Region, wrote in the news release.